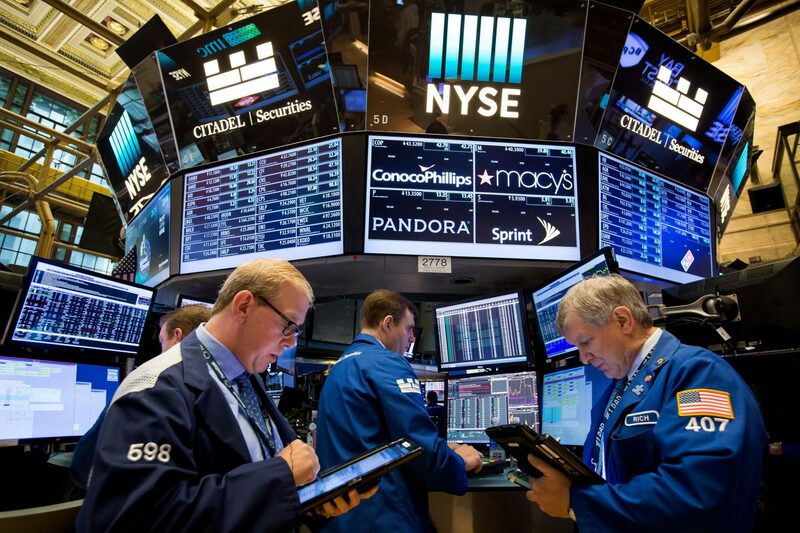 U.S. stocks fell on Friday as further losses in oil prices sparked fears of a global economic slowdown, but the major indexes still managed solid weekly gains. The Dow Jones Industrial Average fell 201.92 points to 25,989.30 as losses in Caterpillar and Goldman Sachs offset gains from Disney. The S&P 500 dropped 0.9 percent to 2,781.01, led lower by consumer discretionary shares and tech. The Nasdaq Composite lagged, dropping 1.7 percent to 7,406.90 as shares of Facebook, Amazon, Netflix, and Alphabet all traded lower. The indexes recovered most of their losses late in the day. At its session lows, the Dow was down 308.31 points. West Texas Intermediate futures fell 0.8 percent to $60.19 a barrel, after briefly breaking below $60 for the first time since March. They also fell further into bear-market territory, trading more than 20 percent below their 52-week high. Disappointing data out of China also dampened sentiment on Wall Street. The country’s top auto industry association said sales in China fell 11.7 percent last month, marking the fourth straight monthly decline. The Shanghai Composite fell 1.4 percent overnight. Caterpillar shares dropped 3.4 percent in the U.S. while General Motors’ stock fell 2.4 percent. “We’re seeing more anecdotal evidence that the global economy is weakening from the bottom end to the top end,” Lau said. The weak Chinese economic data come as the U.S. and China engage in a trade spat that has been going on for most of the year. The two countries have slapped tariffs on billions of dollars worth of each other’s goods as the U.S. seeks a better trade deal with China. Comments from White House trade advisor Peter Navarro soured optimism about a possible deal between the two countries. “If there is a deal — if and when there is a deal, it will be on President Donald J. Trump’s terms. Not Wall Street’s terms,” he said. Navarro’s comments come ahead of a meeting between Trump and Chinese President Xi Jinping at the upcoming G-20 summit. Although a statement released by the institution noted a moderation in business investment, it said the bank still expects “further gradual increases” in the prime lending rate. Traders had been on edge last month due to concerns over the Fed’s rate hiking path. But equities still recorded strong gains for the week, following a big post-midterm elections rally. The S&P 500 and Dow gained 2.8 percent and 2.1 percent for the week, respectively. The Nasdaq, meanwhile, rose 0.7 percent. This week’s gains were the biggest for the Dow since the week of March 9, when it rose 3.25 percent. On the earnings front, Yelp shares plunged more than 26 percent after releasing its latest quarterly results. Dow-member Disney, meanwhile, rose 1.7 percent on the back of better-than-expected results.